"When I started my work around 2000, it was sort of radical to be thinking about epigenetics and autism. themselves or being regulated by epigenetics." Janine LaSalle, Ph.D, is a pioneering researcher in the field of epigenetics and its role in autism-spectrum disorders. She is currently a professor of medical microbiology and immunology and chair of the Integrative Genetics and Genomics graduate group at the University of California, Davis, as well as a member of the school's world-renowned MIND Institute. Her laboratory focuses on epigenetics of neurodevelopmental disorders through the investigation of genetic mouse models, neuronal cultures, and postmortem human brain. Having done extensive work on the MeCP2 gene, that is mutated in Rett syndrome and other diseases, LaSalle has more recently become interested in environmental exposures and gene-environment interaction. 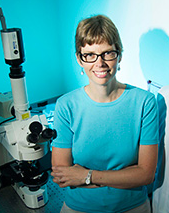 After studying biology at Randolph-Macon College as an undergraduate, Dr. LaSalle completed her Ph.D. work in immunology at Harvard University. She initially joined the Howard Hughes Medical Institute and Boston Children's Hospital as a postdoctoral fellow in human genetics, and afterwards started her own lab at UC Davis in 1997. Interviewed by Meeri Kim, Ph.D, April 2014. You were one of the first people to start investigating the epigenetics of autism. How did you first become interested in this angle? 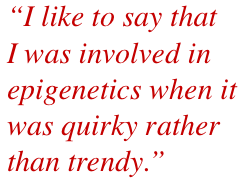 I like to say that I was involved in epigenetics when it was quirky rather than trendy. As a postdoctoral fellow, I was working on epigenetics of parental imprinting for Prader-Willi and Angelman syndromes — two disorders also considered to be on the autism spectrum. Their rules didn't seem to fit normal Mendelian inheritance, aspects like imprinting and X-inactivation. In those days, these epigenetic examples were of interest, but people thought they only held for specific regions. After starting my own lab at UC Davis in 1997, the school's MIND Institute was beginning to get in the works. I received a pilot grant for autism research from the Institute, and started working on MeCP2, the Rett syndrome gene that was discovered in 1999. I started asking questions about rare genetics disorders that affect epigenetic pathways, and how they may be involved in more idiopathic forms of autism. For instance, we looked at MeCP2 levels in autism post-mortem brains as compared to age-matched controls and saw differences in about 70 percent of them. That was the first hint that we were onto something. Also, some of the genes on chromosome 15q that I was working on for Angelman and Prader-Willi were also dysregulated in autism. 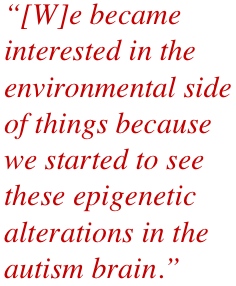 When did you become focused on how environmental exposures can affect germline epigenetics? About six or seven years ago, we became interested in the environmental side of things because we started to see these epigenetic alterations in the autism brain and wanted to know where they may be coming from. Also, being at the MIND Institute, I saw a lot of the epidemiology data. Because the MIND Institute is very interdisciplinary, there's people asking questions from all angles — epidemiology, toxicology, etc. — which is really nice. I was seeing data from California — particularly the rates of autism on the rise over the last decade — that, as an epigeneticist, started to make me wonder. I was trained as a geneticist, but I thought there could be some interesting interactions at the epigenetic level between genes and the environment in autism. We started with projects involving flame retardants, or polybrominated diphenyl ethers (PBDEs), in a mouse model. We found that female mice born to PBDE-exposed mothers that were genetically more susceptible to develop autistic behaviors ended up less social and with impaired learning skills. Then for a human investigation, we looked at a little over 100 postmortem brains: those with idiopathic autism as well as controls with no neurological abnormalities. We also included as another control group those with a variety of genetic disorders including 15q deletions and duplications, Rett syndrome, and Down syndrome. The aim was to see if those with autism had higher levels of PBDE and polychlorinated biphenyl (PCB) chemicals in their brains. Let's start with the human brain tissue study. What were your main findings? The results were actually a big surprise. We went into the study naively thinking it was going to be the idiopathic autism that would have higher levels of chemical exposure, but what came out was that increased levels of one PCB in particular — known as PCB 95 — was linked to a genetic disorder called Dup15q. Dup15q is a copy number variation where you have a duplication of chromosome 15 and is seen in about 1 to 2 percent of autism cases. Now we're trying to figure out why, and what really is the gene-environment interaction that's going on. For the first time, I realized there could be a transgenerational effect; as in, we might be seeing the effects of exposures that actually happened a generation ago. PCBs were banned in the 70's — but we still haven't completely gotten rid of them. The group we saw Dup15q in were all born after the ban, so we're assuming that this effect is coming from the mothers' exposure. However, these are experimental questions that still need to be asked at this point. We're trying to do more using high-throughput sequencing to find specifically what the epigenomic changes are that are happening with Dup15q and PCB exposures. Now let's talk about flame retardants — what did you discover with your mouse model of exposure to PBDEs? These are chemicals that have been recently banned in California, but there's still so much hanging around our environment. Because they are chemically very similar to PCBs, the question is should we be concerned about their effects on the next generation's health? We don’t think that flame retardants or any other chemical is a single smoking gun for autism, but we wanted to find out whether you could have genetic susceptibility that combined with environmental exposure at the epigenetic interface. Could that compound the problem? We chose a mouse model that was both genetically and epigenetically susceptible to develop autistic behaviors. The mice we used were genetically engineered with a mutation in the MeCP2 gene, which caused them to have mild social and learning defects. We exposed them perinatally to this flame retardant, BDE-47 — so 4 weeks prior to conception, throughout 3 weeks of pregnancy, as well as all the way through lactation. It was a total of 10 weeks of exposure. Initially, we began with a high dose of BDE-47, but saw major reproductive effects which meant too few pups to study. That dose didn't see effects in wildtype mice, but it was really in our genetically susceptible model that we saw a higher dosage sensitivity. So the dose we ended up using was actually very low, and when we compare this to humans, the level was at right about the average PBDE dose of people born from 1950 to 2000. A lot of toxicology studies just give the mice one big whopping dose, but we really wanted to mimic a normal exposure. Off the bat, the female offspring of exposed mothers were smaller in body weight. Some of the behavioral test results were normal, but we saw deficits in social barrier tests that measure sociability. In a spatial learning test, we saw a compounding effect of mutation plus exposure. But the results from the sociability test were really not dependent on the mutation. 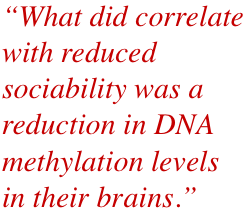 What did correlate with reduced sociability was a reduction in DNA methylation levels in their brains. Again, this was specific to the females and not the males. There are some very interesting complexities involved with gene-environment interaction. With such evidence of the interplay among genetics, epigenetics, and the environment continuing to emerge, would you say that people are becoming more accepting regarding the idea of gene-environment interaction? Yes, particularly over the last year or two. It used to be camped — the genetic camp and the environmental camp — and I was always in between somewhere. But over the last year or two, I've been hearing the more traditional geneticists say that autism is likely a complex interaction between genes and the environment. When I started my work around 2000, it was sort of radical to be thinking about epigenetics and autism. I think now people are realizing that the genetics alone can't explain autism risk, and that there is compelling evidence for a lot of the genes involved in autism either being epigenetic players themselves or being regulated by epigenetics. So even the genetics is pointing to epigenetics. There's been a lot of autism research done over the past decade, and if the genetics were simple it would have probably be solved by now. Clearly, causation points in the direction of complex genetics, and complex genetics means that it is likely multiple genes interacting with the environment. Do you think those genes involved in susceptibility could also be more vulnerable to environmental exposures? That's a great question, and it is something we're thinking about. There are genes we call housekeeping genes that are pretty much on all the time, in all your cells. The synaptic genes are not — they're the ones that tend to be only expressed in neurons, and a lot of these are just emerging in early life. As a result, I think both in fetal life and in early post-natal development, there's that window of susceptibility for these genes that need to be turned on appropriately. So in that way, they could be more susceptible to environmental triggers. Plus we're starting to look at the map of DNA methylation in various tissues, and they also point to the synaptic genes having a sort of special location in the genome. There's almost a landscape to the methylome, and synaptic genes seem to be hiding out in specific locations that are responsive to signals in early life. This means they really need to get the right DNA methylation, at the right time in neuronal development, in order to be healthy. What are some of the environmental factors that research has shown can have an effect on germline epigenetics? Definitely things like smoking and alcohol during pregnancy — those also tend to reduce DNA methylation. There's also a large number of chemicals that can have a similar effect: some of the heavy metals, mercury, lead, persistent organic pollutants. There was a study on PCBs in the Inuit population in Alaska, for instance. Because their diet is almost all fish, and PCB concentrations are high in fish, the study saw a correlation between reduced DNA methylation and higher levels of PCB exposure. Obviously some of these things may have more direct ways of having toxic effects on brain development, whereas others have indirect effects. Also, high exposures can reduce the supply of methyl donors for DNA and the other things that get methylated as well like proteins and RNA. What is an important area that autism causation research needs to cover in the next few years, in your opinion? It isn't easy, but for human populations, we really need to look back a generation at environmental exposures. 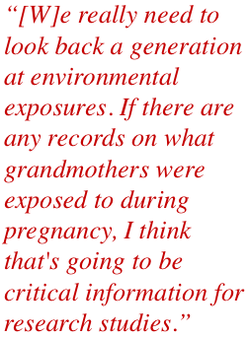 If there are any records on what grandmothers were exposed to during pregnancy, I think that's going to be critical information for research studies. Records were not so good in those days, but if you look back at the generations born in the 50's and 60's, there are some compelling things such as medications that women were exposed to. In those days, they didn't really think of pregnancy as a susceptible time for the fetus because of the view of the placental barrier. Also, researchers should look into the number of chemicals that have emerged in our environment since World War II — those that companies were making before it was realized that there might be adverse effects. Hopefully, we can learn from past mistakes. Tell me about a currently ongoing research project in your lab that you are excited about. The human placenta is a good time capsule for what happened in utero. In the placenta you really see early life epigenetic marks such as DNA methylation — the landscape of the methylome I mentioned earlier — and once you get out into the mature tissues like brain, that goes away. It is almost like there are areas of the genome that are kept out of the way for DNA methylation in early development within the placenta. This could just be a unique lineage, a different cell lineage than the inner cell mass that goes onto become the fetus. If a child has been diagnosed with autism, it is tough to go back and get a sample of the placenta. I'm fortunate to be getting some samples from a prospective study here at the MIND Institute where they're studying high-risk families — families with at least one autistic child — that are planning another pregnancy. So they're collecting placenta samples during pregnancy, placental cord blood during birth, and then follow the child's development up to age 3. We are mapping the methylome of these samples hoping to identify an epigenetic biomarker at birth that could be predictive of autism because there's a lot of indication that early behavioral intervention could be helpful. What we're already seeing is that these areas of lower methylation, called partially methylated domains, are where there's the most variation among individuals. We're really focusing in on these off-the-map regions in a tissue that really hasn't been looked at much for biomarkers. Hopefully, we will find something different in the cases that go on to develop autism. It sounds like a fascinating study. How about your long-term goals as a scientist? Where do you ultimately want your lab and your research to go in the next several years? I really want to understand DNA methylation and what it means. I've been around in epigenetics since the 90's, and sometimes when a field is so new, you have to go back to the drawing board. I'm doing that now with methylation. Anyone who is looking at the genome-wide view and doing genome-wide methylation analysis is realizing that the current data don't fit the old models. Instead of regulating gene expression, I think that methylation could be a mark of past gene expression that is related to the regulation of a gene, but may not be the direct regulator itself. The textbooks will tell you that DNA methylation is always silencing. But for these partially methylated domains in the placenta which have reduced methylation, the genes are clearly turned off. So you almost have to flip the thinking and come up with new models. I think it has a lot to do with chromatin accessibility; as in, when a gene gets transcribed, the chromatin is now open and accessible to DNA methyltransferase that can then methylate it. Methylation could be historical marks of past transcriptional events in early life that are reinterpreted for the future.